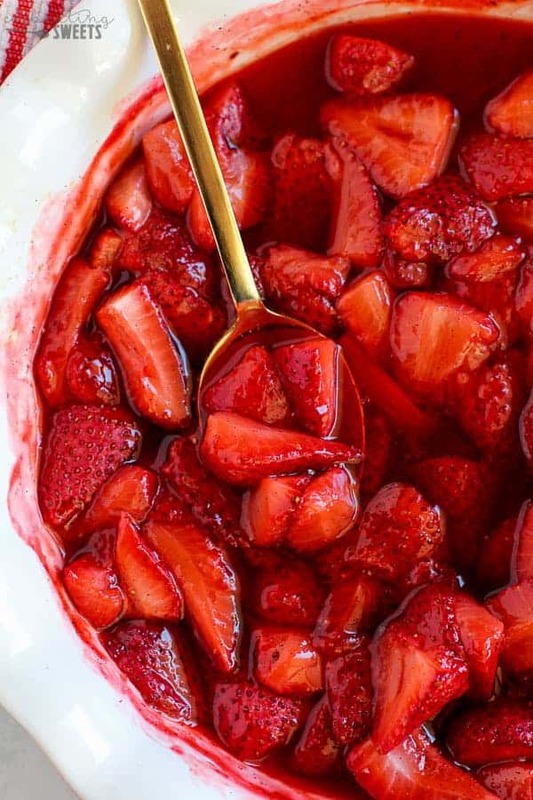 A super easy recipe for sweet and juicy Roasted Strawberries. Eat them on their own, or use as a topping for yogurt, ice cream, oatmeal, pancakes, waffles, cake and more! Today I’m bringing you the easiest recipe ever. If you can slice strawberries and turn on an oven, you can make this recipe. It doesn’t get much simpler than two ingredients and two steps. 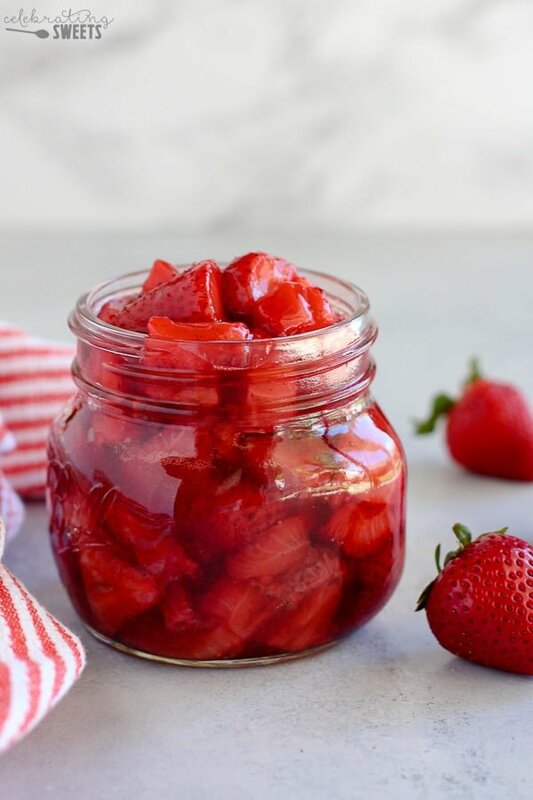 What’s even better than the simplicity of this recipe, is the end result – sweet, syrupy strawberries that have the best strawberry flavor you have ever tasted! My family absolutely loves berries. As the weather starts warming up berry recipes are plentiful around these parts. We just can’t get enough! I often make these Roasted Strawberries during the time of year when strawberries are not at their peak. 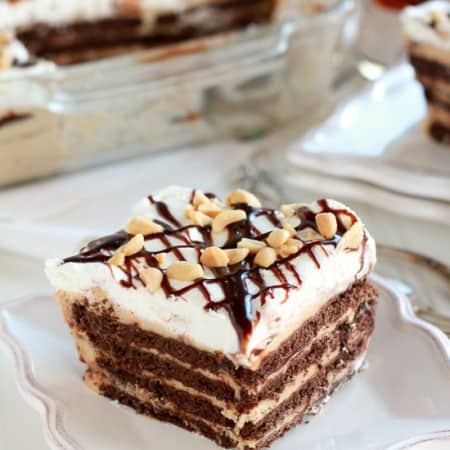 It is the perfect way to make them extra sweet, and intensify their flavor. And during berry season if you go strawberry picking (pssst…bring me!) and you pick way too many berries, this here is what you should do with all those extra berries. 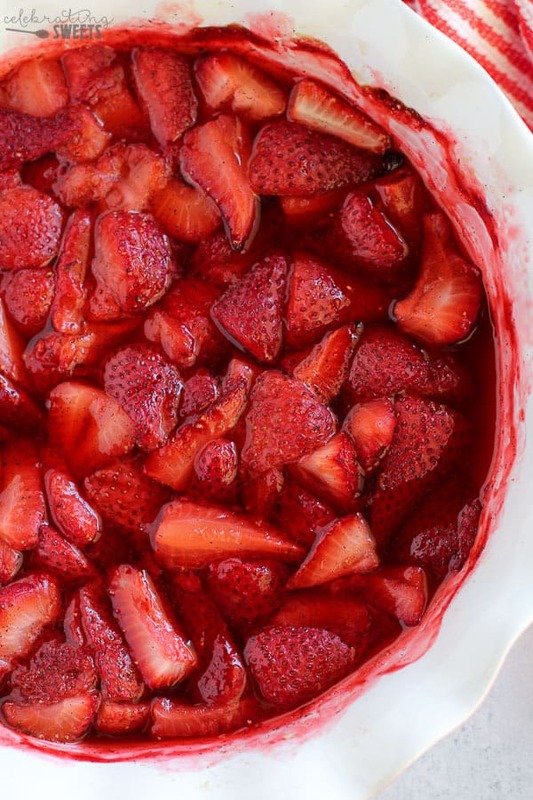 This recipe is basically two steps: toss strawberries with sugar and bake in the oven. 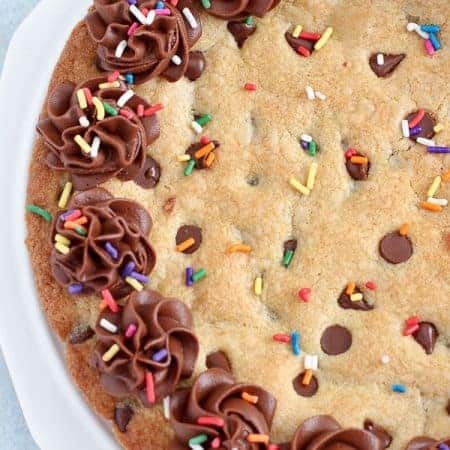 I recently started adding a vanilla bean to this recipe, and if you happen to have one, even just a small piece, I highly suggest that you throw it in. 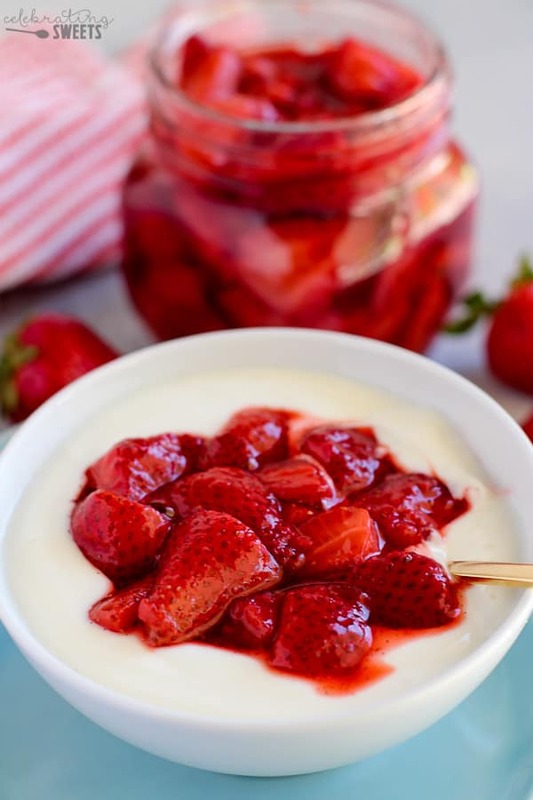 The vanilla bean makes its way through those juicy strawberries and gives every bite a subtle vanilla flavor. Also, you can’t beat those little black flecks of fresh vanilla bean. Once you try the combo of vanilla and strawberry you will be hooked. So, what should you do with these Roasted Strawberries? 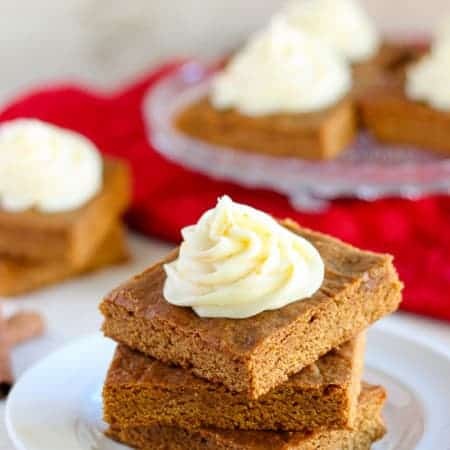 You can eat them straight from the baking dish while they are still warm, or you can chill them and use them as a topping for yogurt, oatmeal, ice cream, pancakes or pound cake. The possibilities are endless! Juicy and sweet roasted strawberries with an intense and delicious flavor. Eat them on their own, or use as a topping for yogurt, ice cream, oatmeal, or cake. Preheat oven to 400. Quarter the large strawberries and halve the smaller ones. Place the strawberries in a 9-inch pie plate or 8x8 baking dish. Sprinkle the sugar over the strawberries and toss several times. Nestle the vanilla bean into the strawberries (if using). 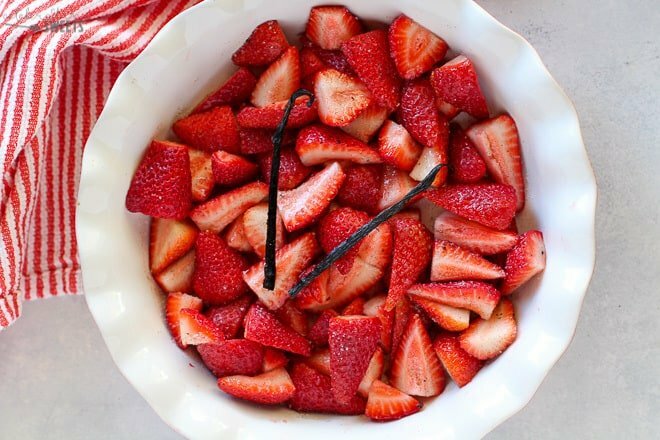 Place the strawberries in the oven and roast for about 15-20 minutes, stirring once during the baking time. The strawberries are done when they have softened and the juices are thick and bubbly. Allow to cool slightly then squeeze the vanilla pod over the strawberries, and stir in the vanilla bean flecks, discard the pod. Cool completely and store in an airtight container in the fridge. 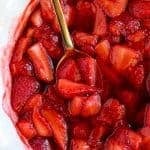 How much sugar to use: If you don't like things too sweet or if you're using ripe, peak-season strawberries, I suggest going with the lesser amount of sugar. You will get a slight balance of sweetness and tartness. If you're serving these with dessert or if you're using under-ripe berries, you will probably want them slightly sweeter, so use closer to 4 tablespoons of sugar. The color of your roasted strawberries will depend on how dark the strawberries are that you're starting with. Deeper red berries will result in a darker final product. I am just loving these!!! I bet they would be amazing with oatmeal!!! I just made these to serve at breakfast with ricotta cream at our B&B. My bet is the guests will love them! Trying them for our grandchildren as a healthy snack! In the oven now. Wondering how they would freeze. We have a long strawberry season and would love to freeze these. Have frozen whole berries but they didn’t do well. I make freezer strawberry preserves which are delicious all winter. Hi, Penny. I think they would freeze ok. Some stores sell frozen strawberries in syrup, and this would be a fairly similar concept. I hope it works out for you. Enjoy!